The colour of the year has been named, and it’s Ultra Violet! 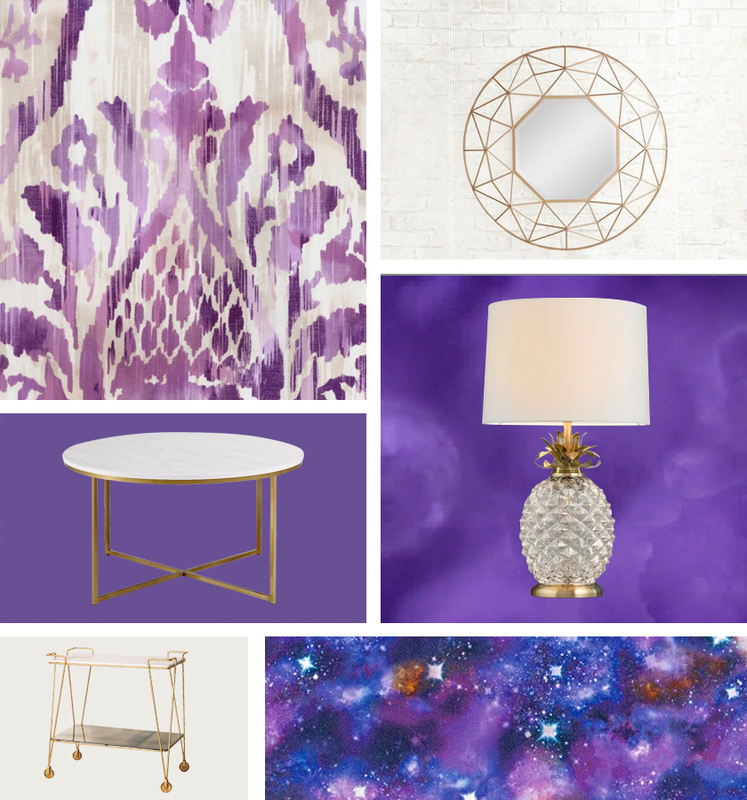 This bold, glamorous purple shade has to be embraced with open arms. It demands to be seen and makes a statement wherever it’s featured. With that in mind, why not incorporate it into your home using our Ultra Violet home styling tips? Our feature wallpapers from Brian Yates and Wallpaper Direct dare to be different, with Ultra Violet unapologetically taking centre stage in the bold prints. The perfect tone to match such a statement colour has to be gold. Adding a sophisticated edge to your space with gold accented accessories such as this mirror, and a gold legged coffee table such as the Amaratha from Wayfair calms the drama of such a bold accent colour. Opting for furniture and accessories with simple, minimalistic designs and clean lines keeps a modern feel and prevents the room from becoming overwhelming. Simple geometric designs won’t be going out of style anytime soon, so why not modernise your space with such accents that will suit a multitude of interior styles. It’s easy to inject some fun into such a style - the attention to detail goes a long way when you are opting for minimal accessories in a room, so invest in fun decorative options for the necessities, such as this pineapple gold and glass table lamp. You can also have some fun with storage by using a retro gold drinks trolley like the Luxe Drinks Trolley from Oliver Bonas. If you’re looking to inject some Ultra Violet into your soft furnishings, or don’t want to brave such a big transformation, then include printed and solid colour cushions to give a nod to this statement colour. The Auberry Opti-myst is the perfect fire to suit this bold interior look, offering a peaceful centrepiece to a room full of character. This modern take on a classic stove design will slip effortlessly into any space, providing the most realistic flame and smoke effect available. It can even be used without the heat, meaning you can enjoy the flame effect of your fire all year round.